I love people who 'do there own thing'! Last edited by WizardOfOdds on Mon Feb 29, 2016 9:23 am, edited 2 times in total. currently very near the bottom of the page? It looks like the trailer's name is Mirage but I'm not sure if that is the model name or who makes it. Last edited by WizardOfOdds on Sat Feb 27, 2016 8:03 pm, edited 1 time in total. I just love those who made-do with what they have! Last edited by WizardOfOdds on Thu Jul 07, 2016 1:36 am, edited 4 times in total. Here is an interesting design from 1929 thats open in both lateral & vertical directions. 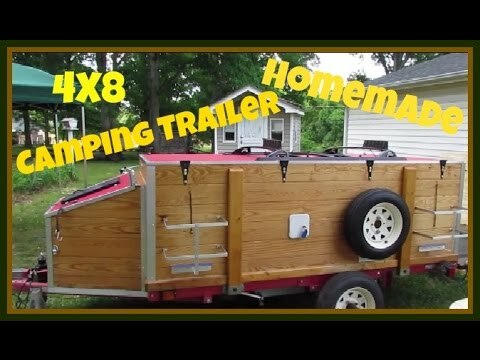 http://blog.modernmechanix.com/novel-camping-trailer-opens-into-comfortable-quarters/. It looks like the sides rotate out while it raises the roof. No picture of how the end cap above the door is covered. I wonder how many (if any) were ever actually on the road. My post of 1 Jan 2015 included a brief of this very interesting trailer, but I was unable to find any further information about it. Now I am delighted to say I discovered a 1929 video clip of it in action. While I am editing the original post to include a link to the video, I am also adding it as a new append because many readers read only new additions to the thread and this is one too good to miss. 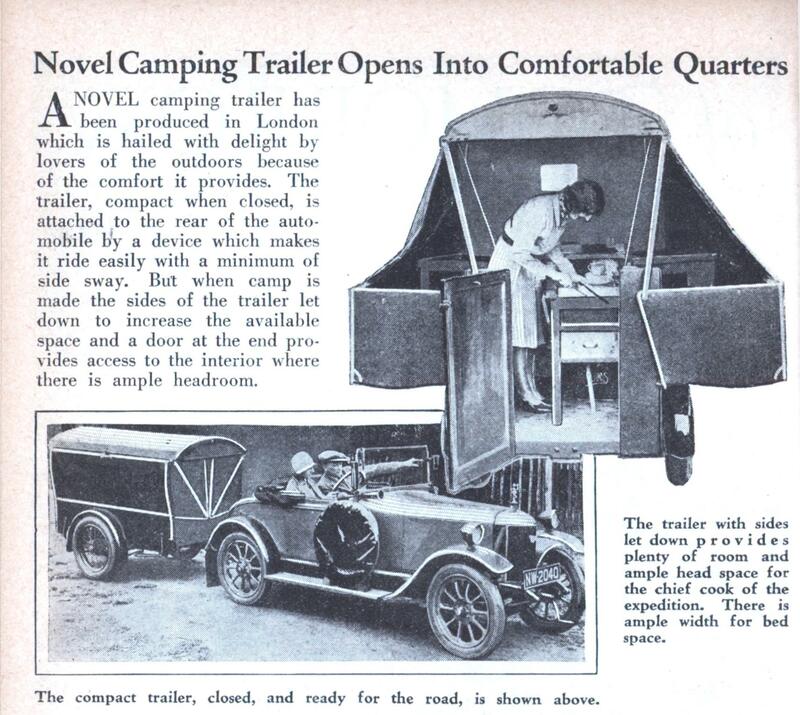 I can’t watch this gem too often: I love the automatic brake, 7 HP tow car, the bed legs bent to match the sculptured sides, and the way it opens and closes. I’m a bit concerned about the rigidity of the top support, especially where it meets the bed end panels. Hard to accept the fact that the young ladies in this video are now well over 100 years old. Calendars can be so cruel. Last edited by WizardOfOdds on Wed Aug 02, 2017 7:40 pm, edited 5 times in total. 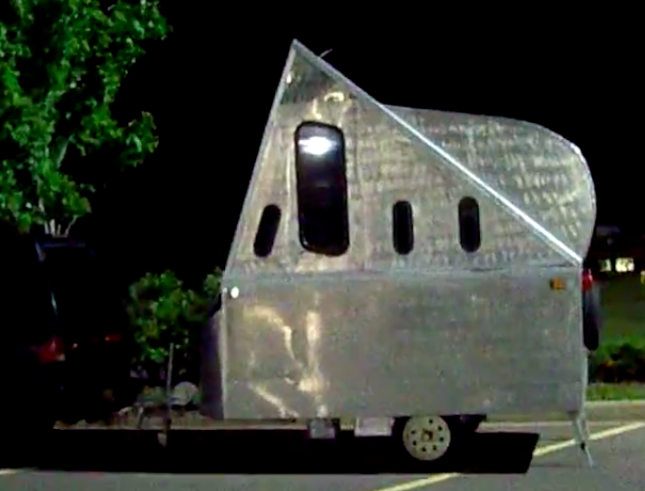 Kiwis version of a redneck teardrop? Must be a lot of tongue weight. agpage....Thanks for the link, I find the Mirage a big improvement over the typical A-frame pop-ups. Seems like many of the more interesting designs are from down-under. KennethW.... Thanks for the posting ... I like what this guy has done. Never heard of a Honda City. Never visited that trading site either. 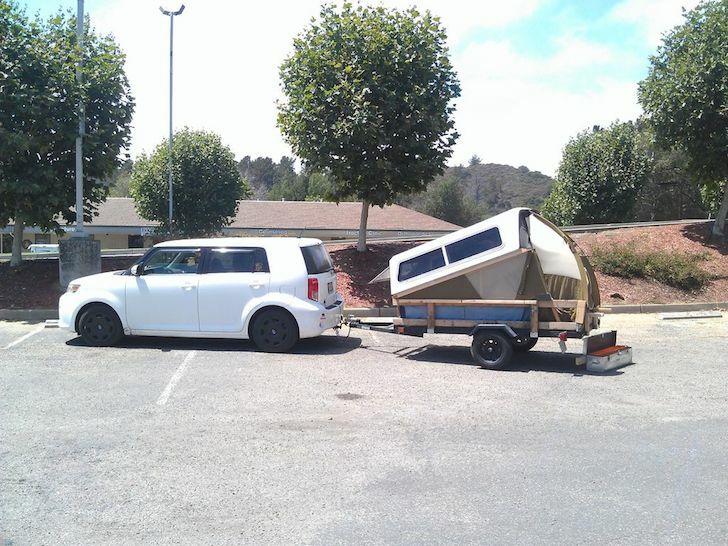 Here is another interesting trailer made from a recycled van on the same site. Love seeing these creative works of art. Thanks for the link. [quote="WizardOfOdds"]agpage....Thanks for the link, I find the Mirage a big improvement over the typical A-frame pop-ups. The only warning is that apparent they can LEAK a lot. But it looked like a build problem not a design problem. I wanted to see a setup video and all I could find was some guy complaining about his "indoor shower"
Ya a Coramal Mirage 455. Here is another picture of it at the same deanship just with the door closed. 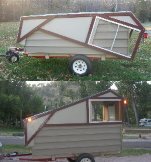 agpage wrote: ....I find the Mirage a big improvement over the typical A-frame pop-ups. I have designed an A-frame pop-up and it's mighty complex to get all the geometry right - complex enough that I decided not to publicly post a design since, to a large extent, if you can't design it yourself, building it would be nearly impossible. 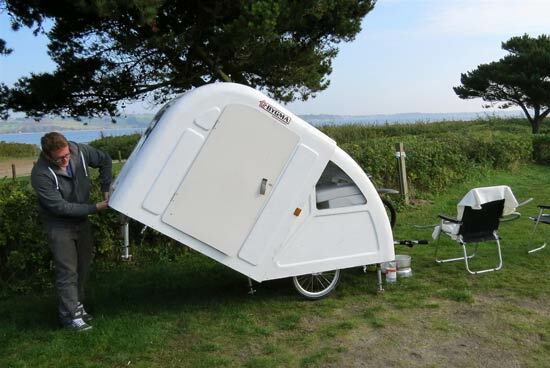 The Mirage five-piece pop-up adds another panel that has to be exactly the right size in two different situations, so the design problem gets bigger, plus you have to devise a way of lifting the roof panel up. It's also a big flat panel to make watertight. I bet the manufacturers of these pop-ups scrapped more than one prototype before they got their design right and for a home-builder that would be an expensive, time-consuming, soul-destroying process. Last edited by WizardOfOdds on Sat Feb 27, 2016 8:00 pm, edited 1 time in total. I like the roof on this one ..
Last edited by WizardOfOdds on Sat Feb 27, 2016 7:58 pm, edited 1 time in total. You may have seen this one already, but I'm posting it here trying to keep a link in this thread.